Hey all- great news! Team Marine has shirts! 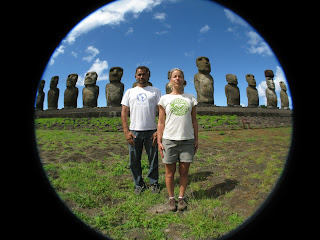 Team Marine member Ecco Theohar designed the T-shirts herself and they turned out awesome. 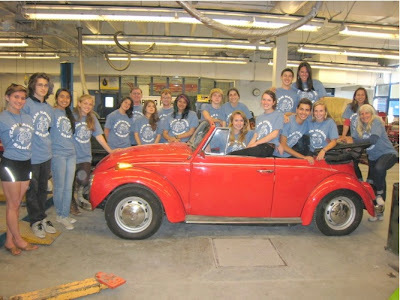 The shirts arrived in time for a group picture on May 19th when the team met with Kristina Vonhoffman from the Alliance for Climate Education with our VW Bug! This year, Team Marine has taken on the challenge of converting a 1970s VW Bug completely to an electric vehicle! Team Marine is All Grown Up! It’s that time of the year again. 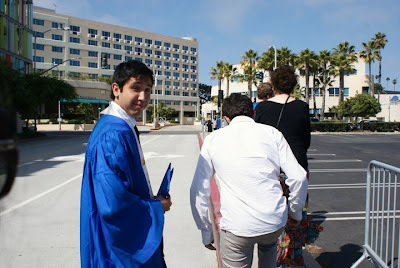 School is coming to an end and the high school graduates are getting ready for college. Recently, we found out where Jessica Thorson, Danny Franco, Kou Collins, and EccoTheohar(our Team Marine seniors) are heading after they graduate from SAMOHI. Team Captain, Jessica Thorson, was accepted into both NYU and Oregon. After receiving a scholarship of $20,000 Jessica chose to attend the University of Oregon for the fall semester where she will be majoring in the romance languages and minoring in environmental studies. She will continue her environmental studies at Oregons coast campus- roughly an hour away from main campus. Danny Franco will be attending St. John’s University in New York City. Kou Collins will be attending the University of Colorado at Boulder. Team Marine wishes the best of luck to all of our beloved seniors and hope that they fulfill their sustainable dreams at the college of their choice. Nhi is in the Bio Olympics! Nhi Ho and David Shabsovich, juniors at Santa Monica High School, will be representing Santa Monica at the USA Biology National Finals round. Every year, over 10,000 students take the US Biology Olympiad (USABO) local test hoping to represent the United States in the International Biology Olympiad (IBO). 500 of these students then move onto the Semifinal round to take a grueling 2 hour test. Out of the 500 Semifinalists, 20 are then selected to attend an intensive residential program at Purdue University to learn about “advanced biological concepts and exacting lab skills.” Four students will then be selected to go to the International Olympiad at Taipei, Taiwan. Out of the five students at Santa Monica High School that took the local exam in February, four made the Semifinalist round. 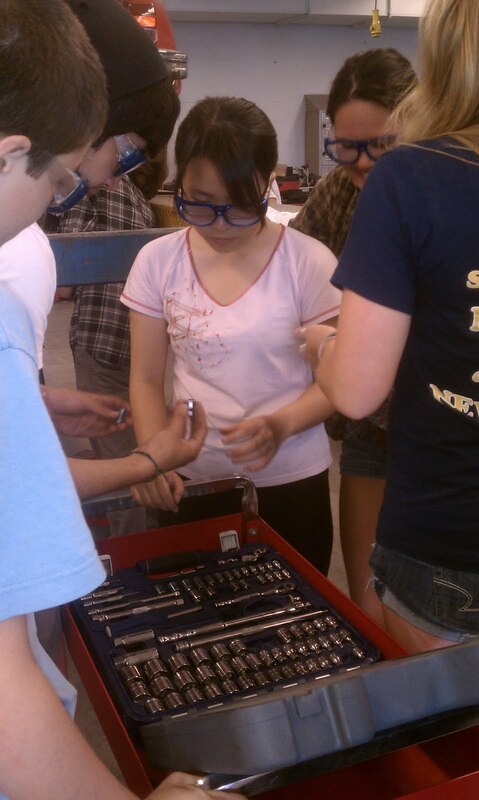 Of those, only Nhi and David advanced to the next round. 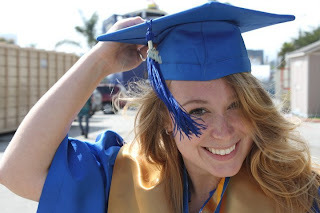 “I’m so excited to be attending the training session at Purdue University during June. If my AP Biology teacher, Mr. Gaida, did not recommended me to take the local test, I would have never made it this far. I look forward to representing Santa Monica at the training in June,” said Nhi, 17. Lets all wish Nhi and David “good luck” in the biology olympiad. Lots of thanks to Mr. Gaida and everyone who made this possible. On April 23th, Team Marine members participated in Caylc’s (The California Youth Leadership Council) Earthday Awareness event hosted by Calyc members at the Skirball Museum In Los Angeles. 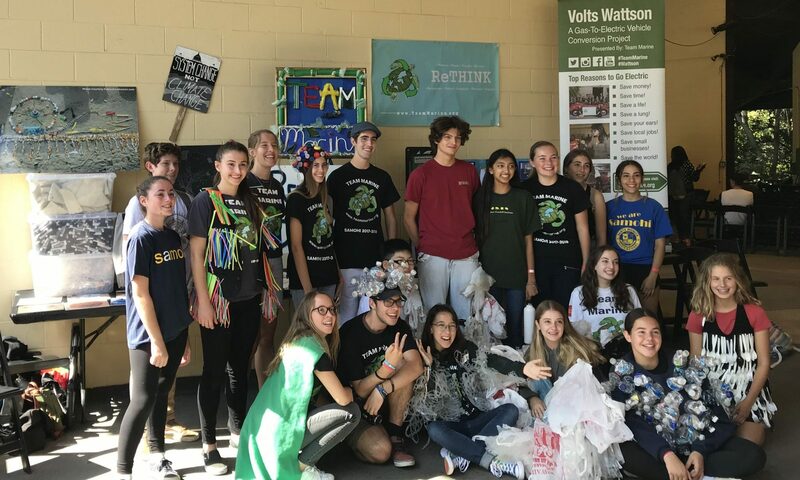 Calyc is a group of dedicated So Cal high school students that plan and implement events to raise awareness about endangered animal species and environmental issues. 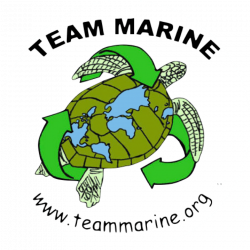 Team Marine member Nhi Ho and other team members helped educate little kids to reuse old t-shirts and cereal boxes to make bags and notebooks respectively. Nhi, Natalie, Alexis, and Maykel presented our Straw Boat made out of 8,000 recycled straws. Everything used to make the boat was either saved by Team Marine and SAMO students or reused including: bottle caps, straws, water bottles, and broken surf-boards. The Team Marine members spread awareness that reuse is often better than “throw-away” thinking for what cannot be recycled. Team Marine did a great job and we are very proud of their work. 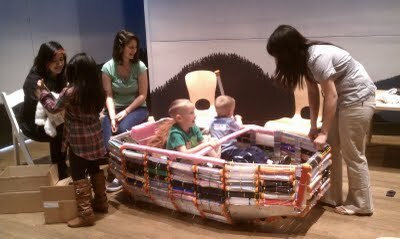 Lots of thanks to the Skirball Museum and Caylc! 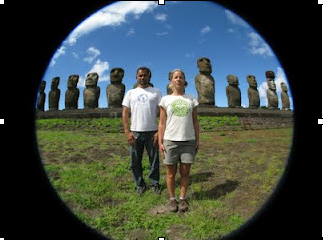 The Algalita Marine Reasearch Foundation and 5 Gyres‘ Ship2Shore trip returned from traveling 2,300 miles to the center of the South Pacific Gyre on April 11th! The research team collected trawl samples and conducted experiments in the ocean and on the shores of Easter Island delivering shocking results. Congratulations to all the members on the Ship2Shore team! WOOOOO! A month ago Benjamin Kay was entered into the Wyland Foundation’s Earth Month Teacher Hero Award by the I House Principle Ms. Semik. 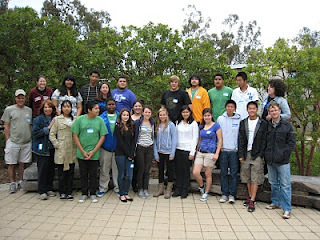 Kay, along with 30 other teachers, were recognized for being outstanding environmental teachers and activists. On April 14th, Mr Kay was selected from those 30 teachers to win the grand prize of $5,000 and be on CBS news! This money will be going towards building our Electric vehicle and will buy a lot of parts. 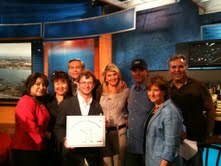 Lots of thanks to the Wyland Foundation, Toyota, AES, and CBS/KCAL. The struggle to convert an old Volkswagen Bug into a fully electric car has been a long and hard one. On tuesday, Team Marine members searched for certain types of 96-volt lithium ion batteries for our electric car conversion. Yesterday, our Eco-Engineer, Patricio Guerrero, was emailed by the manager of a battery manufacturing company telling us that they could custom build batteries to fit the necessary dimensions for the back seat of our Volkswagen Bug! As if this wasn’t good enough news, Patricio also purchased new throw-out bearings. The throw-out bearings are important because they allow the engine to maintain momentum without consuming energy while the clutch is engaged. These small feats bring us a few steps closer to making our dream of a fully electric Bug a reality. 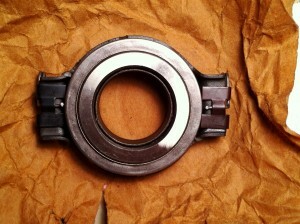 VW-1339-c Throw-out Bearing with clips! Team Marine has been busy for the last couple of weeks doing a Santa Monica High School water fountain audit. 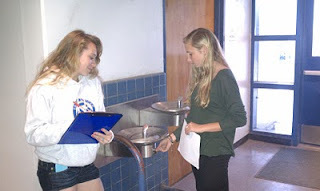 We have been asked to go around the Santa Monica High School campus to check all of the water fountains and describe the condition of each fountain. We were asked by the Santa Monica Malibu Unified School District to do this in order to get an improvement in our water fountain systems. There are approximately 62 water fountains all over the Samohi campus; we found that 43.7% are functioning normally, 15.6% are shooting out water, 15.6% of them are dying, and a total of 25% are out of order and completely dead. A total of 65% of them were functioning. We went around school and mapped out all the fountains and collected that data into a master map of our entire school. The data will be given to the district soon. 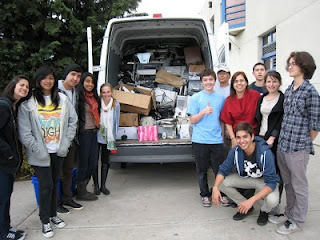 > Team Marine recently assisted Science teacher Martha Chacon and her students in their electronic recycling drive (E-Waste Drive) from March1st– 15th. Together as a school we collected a variety of over 233 electronic devices. Some of the devices collected were from remotes, lamps, and ink cartridges to digital cameras, batteries, power drills and blow dryers. the number one item collected were mobile cell phones-74 to be exact. Along with some of Ms. Chacons students, Team Marine successfully loaded all the electronics onto a truck and send it off to California Recycles be properly disposed of. Big thanks to Martha Chacon! Team Marine sorting out all the electronics. Team Marine was invited to go to a leadership training brought to us by one of our amazing eco-partners, Alliance for Climate Education (ACE). Team Marine members Raquel, Flavia and team advisor Benjamin Kay were present at this event on Saturday April 2nd 2011. This leadership training was at the TreePeople headquarters. Flavia and Raquel learned valuable lessons such as preplanning agendas to make meetings more productive, and valuable tips on how to be better communicated within the team. We would love to thank Kristina Von Hoffman, Sophie Korn and the rest of ACE for having us participate in this wonderful event.